Bear Hugs is a beautiful cabin built for two, with the sights and sounds of a sparkling mountain stream running just in front of this chalet. The worries of this life will be the least of your cares when you step into this one bedroom chalet. 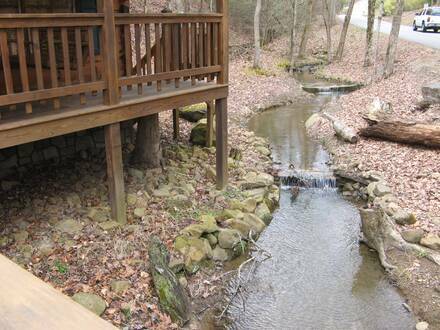 A small foot bridge takes you across the mountain fed stream to the front deck complete with deck furniture and a porch swing. You will find it nearly impossible to peel yourself away from the porch when you hear the peaceful sound of the babbling brook that begs you to stay a minute longer. Inside you will find a fully equipped kitchen and a master bedroom with an in room Jacuzzi. The cozy living room is inviting with a stone fireplace and television with cable. This cabin is perfect for a honeymoon or couple's getaway. Bear Hugs is located just 2.5 miles from the parkway in Pigeon Forge, only minutes away from Dollywood, Dolly Parton's Stampede, Wonderworks and a host of Theaters and Restaurants. It is just a short drive to Gatlinburg and The Great Smoky Mountains. While staying at Bear Hugs you have access to our Resort Pool that is just a short drive. Don't pass up your chance to stay and play in Bear Hugs. Don't Delay, Book Today!